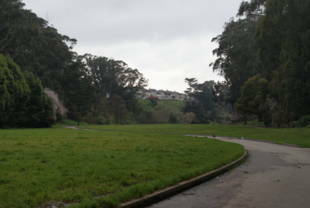 The renovation here has been extensive and has made this open space one of the most beautiful parks in San Francisco! To start, this park is graced with a gorgeous meadow and eucalyptus grove. This place is perfect for one of San Francisco's inconsistent hot days-- there is Laguna Puerca Lake that keeps the area a bit cooler. The lake is beautiful to admire and great to sit by and lounge! 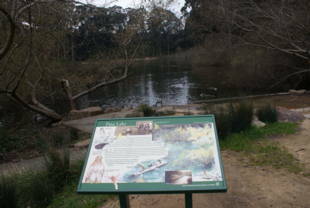 It is adjacent to Stern Grove, which makes a great additional trip on your excursion. There are decent footpaths to explore, and plenty of parking. 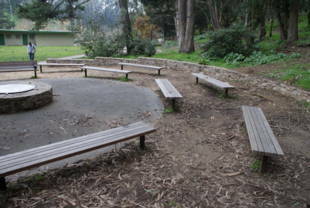 Pine Lake Park is owned by the San Francisco Recreation and Park Department. L-Taraval -- 46th Avenue/Wawona/Zoo stop. Walk down to Sloat and catch the 23-Monterey inbound bus. 17-Parkmerced -- Junipero Serra Blvd. and Sloat Blvd. Transfer to the 23-Monterey (outbound) bus. 23-Monterey -- Sloat and Vale; walk north past Crestlake Drive. 28-19th Avenue -- 19th Ave. and Sloat; walk west along Sloat to Crestlake, follow Crestlake to the walking trail (alongside Vale Ave.) that leads into the park. If you don't want to walk, you can transfer to the 23-Monterey outbound bus. 29-Sunset -- Sunset Blvd. and Yorba St. Walk east along Yorba to Crestlake, then follow Crestlake to Vale Ave.
A homesteader, a widow, a tenor, and a park superintendent became the unlikely mix that produced Stern Grove and Pine Lake Park. George M. Greene was the pioneer who homesteaded a land grant that is now the site of the Grove and who planted its eucalyptus trees in 1871. Rosalie Meyer (Mrs. Sigmund) Stern was the widow seeking a memorial to her husband in 1931. Tenor Lawrence Strauss stood on the Grove's southern hillside and sang a song, at Rosalie's request, while she listened from the northern slope and thrilled to the clarity of the sound. And Superintendent of Parks, John McLaren, was the man who first told Rosalie that the eucalyptus grove was 'a place that you should have.' Its excellent acoustics sealed the deal. This natural amphitheater would be a fitting way to remember Sigmund Stern, whose life had been an example of civic service and sharing. In 1931, Rosalie bought the property for $50,000 from George Greene and deeded it to the city, stipulating that it be used solely for recreation -- 'music, dramatics and pageantry,' and 'under the jurisdiction and control of the Playground Commission of San Francisco,' of which she was president. Source: The Stern Grove Midsummer Music Festival: The First Fifty Seasons by Laurence Rothe, Stern Grove Festival Association, 1987. Preparing the property for dedication as the Sigmund Stern Recreation Grove, Rosalie Stern enlisted architects Gardiner Dailey and Bernard Maybeck to design the landscape and restore the Trocadero, the elegant Victorian hotel/resort built by Greene in 1892. Frequented by San Francisco's carriage trade, it was, in its early 1900s heyday, the rendezvous of the elite, a hideout, a refuge, and sometimes a site of revenge. Prohibition closed the Trocadero because, Greene said, 'I wouldn't have bootlegging here.' He was living there when Mrs. Stern bought the property. On June 4, 1932, Mayor Angelo Rossi dedicated Stern Grove with speeches from assorted dignitaries and a program of performances by children. The dedication concert established the tradition that the Grove's Midsummer Music Festival be preceded by the Recreation and Park Department's Carnival, a showcase for performances by children from the city's parks and playgrounds. On June 19th, Gaetano Merola of the San Francisco Opera, conducted the first concert in Stern Grove's amphitheater, and in 1938 the Midsummer Music Festival became the annual outdoor concert event that continues to this day. In 1932, Rec and Park began to acquire additional land, and, by 1938, had increased the park acreage to 33.5 acres, for a cost of just $170,200. The Works Progress Administration (WPA) was enlisted to grade the roadway down to the amphitheater, build walkways and erect retaining walls. 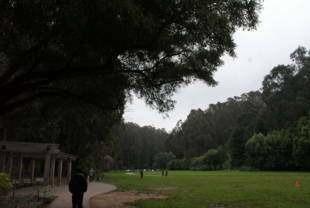 Today, with the adjoining Pine Lake tract, the Park spreads over 63 acres, bounded by Sloat Boulevard, Wawona Street, 19th Avenue on the east and 34th Avenue on the west. There are tennis courts, lawn bowling and croquet courts, golf putting greens, picnic tables and a children's playground. Pine Lake, around which gentlemen used to row their ladies in the Trocadero's days, has a major, ongoing ecological problem, says Dylan Hayes of the Friends of Stern Grove/Pine Lake. In 1997, its surface was covered with a smothering blanket of the invasive aquatic primrose (Ludwigia hexapetala). Rec and Park had it removed with an aquatic harvester, freeing habitat for use by the aquatic wildlife and helping restore the ecological balance. However, the plant has come back in full force and again needs mass removal. Hayes hopes to help coordinate future efforts with Rec and Park's Natural Areas and Volunteer Programs (N.A.P.). 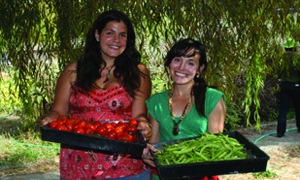 The Friends generally hold workdays via the N.A.P. on the third Saturday of the month. They work with other community and school groups doing habitat restoration and addressing such other problems as erosion of the lake's surrounding slopes due to off-trail use, and the impacts of increased park visitation. To get involved, contact Dylan Hayes at (415) 759-0101. If you have a chihuahua, go to http://chihuahua.meetup.com/445/ to get more information about other chihuahua owners meeting here at Pine Lake. Crestlake St. and Vale St.